Another part of the country that is hard to describe in a short list is the plethora of delicious meals that have been created and shared in Brazil. While there isn’t one specific regional dish, there are numerous distinct regional dishes. There’s a bountiful variety of vegetables, fruits, spices and protein. Food markets are a superb way to experience this variety for yourself. If you prefer to have the food prepared for you instead of getting hands-on, check out these five restaurants who can whip up a Brazilian dish for your enjoyment. Located in Goias, Brazil there is a unique restaurant called Fazenda Babilônia, which translates to Farm Babylon. This farm is a landmark that is well-known for its historic value and was declared a National Historic Heritage Site in 1965. Back in the late eighteenth century, this land and its buildings were one of the largest sugar mills in all of Brazil. Now, Fazenda Babilônia is dedicated to preserving its rich history and heritage while serving up a traditional country-style breakfast on the weekends. 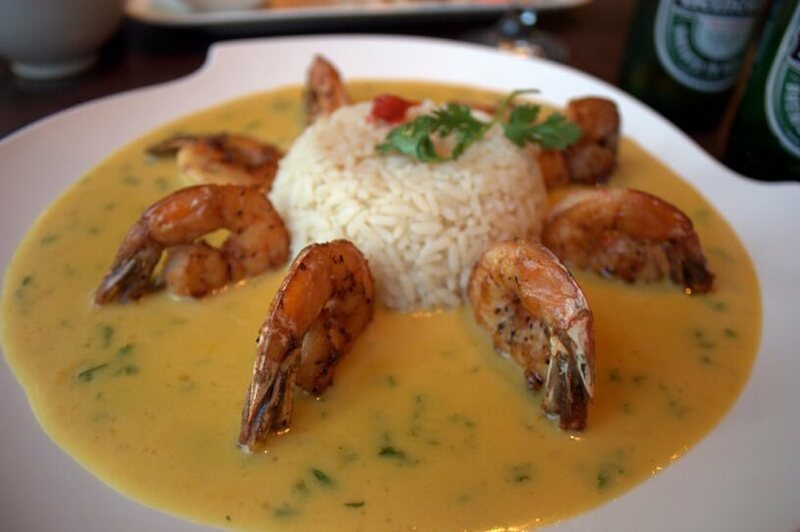 Over 40 items make up the menu that takes you on a trip back in time to Colonial Brazil. At this meal, modern technology is ignored in favour of traditional preparation and production. Read more about their menu on their website. The female powerhouse behind Curitiba’s hottest restaurant is Monella Buffara, a classically trained chef who worked for two of the most famous kitchens in the world. Now that she has struck out on her own, she has found gold in Manu. It’s located in a trendy neighbourhood called Batel, and it offers guests three tasting menus that range in prices. Reservations are essential to dine at this establishment, but if you are looking for a special meal to share with your travel companion, Manu cannot be beaten. Try classic dishes like bobó de camarão (manioc paste flavoured with cashews, coconut milk and prawns) or Sunday chicken (a fowl-focused pot roast) and enjoy your evening dining in one of the best and brightest restaurants in Brazil. Located in Ponta Negra, Camaroes Potiguar is a stylish and creative homage to prawns. That’s right—prawns! Another fantastic seafood option in Brazil is this bright and charming restaurant that never wants for a crowd. Find your way into the restaurant and start your meal with a refreshing appetiser followed by any number of the unique and scrumptious options available. For those travellers who are allergic to or not a fan of prawns, ample dishes are featuring different proteins to satisfy your tastes. The environment is half the entertainment with walls made of wine corks, plants and more! Seafood and Barbeque. Two cuisine concepts that aren’t usually paired together are matched beautifully at Restaurante do Antônio. Once you are there, you will be treated to a rustic scenery to enjoy your meal. The restaurant is 7km from Atins and is located in the middle the dunes and the sea which mean it isn’t the easiest place to get to (two hours by foot, R$40 by car). With lagoons nearby, it would be easy to make this culinary feast a half-day adventure. Explore the lagoons and then have a leisurely lunch at Restaurante do Antônio, and you’ll have beautiful memories of the place for a lifetime. Rich scents flavour the air and as you make your way through Brazil, be sure to venture off the beaten path and try a new dish or two. You’ll get an authentic taste of what Brazilian cuisine is made of and maybe even find a fresh favourite meal. Cover your travels and your health with a travel health insurance policy from Cover-More Australia. It’s hard to predict everything that can happen on holiday, but with a policy in your back pocket, you can relax knowing you are protected against the unexpected. Disclaimer: Please exercise caution while travelling in Brazil and always be sure to check Smarttraveller’s website for the most up-to-date precautions and travel advice.